Home/psychology/When do novices become experts? It’s a fairly well established principle of cognitive science that experts and novices think differently. Being aware of these differences can make a big difference to teachers. For instance, if we assume that most children in most situations are likely to begin as novices this could help point the way to more effective instruction. 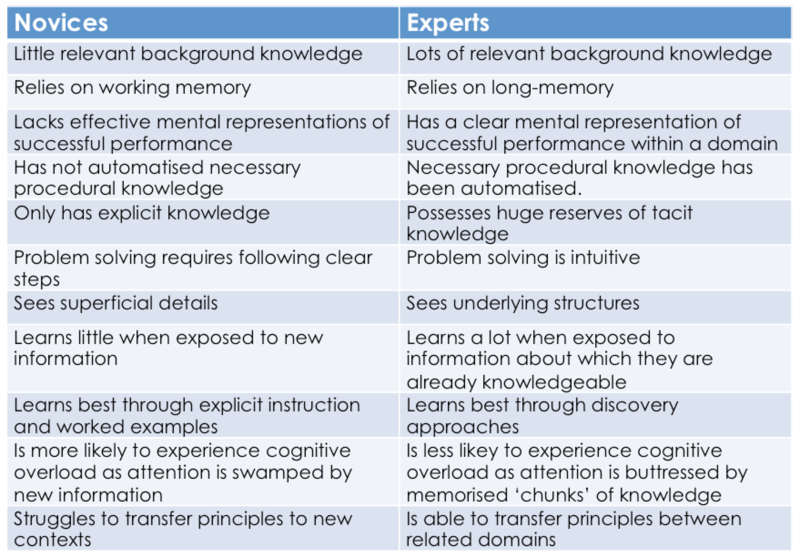 Here’s a summary of some of the main differences between experts and novices. One of the most interesting findings to come out of the research into Cognitive Load Theory is the finding that experts and novices both experience cognitive overload, but experience it differently. Novices, by definition, lack knowledge and experience in the domain they are trying to solve problems in. This means they lack the robust, interconnected schema in long term memory which allows experts to overcome the limits of working memory. As John Sweller puts it, “Novices, not possessing appropriate schemas, are not able to recognize and memorize problem configurations and are forced to use general problem-solving strategies such as means-ends analysis when faced with a problem.” Means-end analysis is likely to lead to cognitive overload because it involves trying to work through and hold in mind multiple possible solutions. A bit like trying to juggle 5 objects at once without any practice. The implication of Sweller’s research into CLT indicates that novices will benefit from explicit explanations, worked examples, goal free problems, and fully guided instruction. For an excellent overview of the strategies most likely to benefit novices learners see Oliver Caviglioli’s Teaching HOW2s. So far so good. However, the research of Slava Kalyuga and others has suggested that these techniques actually increase cognitive load for experts. What’s become known as the ‘expertise reversal effect‘ predicts that as we acquire the schema needed to free up working memory capacity, we start to benefit from less instruction and more freedom. 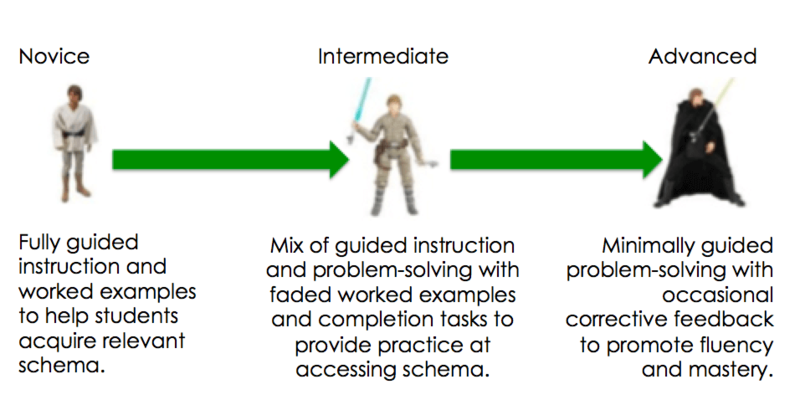 Essentially, what’s effective at helping students to acquire schema becomes unhelpful once schema have been acquired. So, the advice is to use fully guided instruction with novices and discovery approaches with experts. For Anders Ericsson, an expert is someone who has achieved true mastery of their subject and has probably spent at least 10 years engaged in deliberate practice. Clearly, this definition is unlikely to apply to many school students. In a classic experiment conducted by Michelene Chi and colleagues, two groups were given a series of physics problems to sort in any way they wished. The first group consisted of physics undergraduates who sorted the problems by their surface features. The experts, who were able to categorised the problems by their deep structure, were physics postgraduates. Again, this is not a situation we’re likely to encounter with school-age children. So, should we just not worry about this at all and treat all students like novices all the time? Well, probably not. Christian Bokhove shared this paper from Robert Plomin and colleagues in which 12-year-olds with “exceptional performance on a battery of reading tests such as fluency and comprehension” are identified as expert readers. It stands to reason that if a 12-year-old is reading at the level of an expert then it would be ridiculous to give her detailed, explicit instructions on how to read. From this we can infer that expertise is relative; some students will have acquired more robust schemas than others and therefore it might make sense to use our aware of the expertise reversal effect to treat them differently. This gradual reduction of structure from novice to advanced level is termed the ‘guidance fading effect’ which makes use of ‘completion tasks’ to bridge the gap from worked examples to unguided problem-solving. This involves giving students partially worked examples to complete with the partial working helping to support limited working memory and the missing information requiring students to engage in retrieval practice and deeper process thinking. Asking when students become experts is probably the wrong question; in any meaningful sense, school-children are not experts. Instead teachers might do best to think about students becoming more advanced, and engage protracted baton passing exercise where we assume that students are building up the relevant schemas required for more advanced problem-solving unless proved otherwise. As students become more confident at tackling problems within a subject we should remove scaffolding and support as rapidly as possible, but stand ready to put it back if they struggle too much. So, how do we know if students are becoming more advanced? Assessment. If students perform fluently in one lesson, this does not necessary mean they will remember well enough to perform well the next. We should always assume that schema need to be reinforced and encourage students not to practice until the solve a problem correctly, but to continue practising until they can no longer get it wrong. And if they cannot answer or solve a problem, more explicit instruction is clearly required. Teaching a class of children is always an uncertain enterprise, and we’ll never know precisely who is where on the journey towards mastery in all the various aspects of the subjects we teach. This doesn’t really matter, as long as we are prepared to see expertise as a quality of the topic not the individual. My best advice is this: don’t let students struggle until they have experienced some measure of success. Any 12-year-old who needs reading instruction would be pretty much off the bottom end of the SEN range. Fluent decoding skills should be firmly in place by age 9 if not before; beyond this, scores on standardised reading tests are pretty much a measure of verbal intelligence. Given adequate decoding skills, reading comprehension very closely tracks oral language comprehension. Willingham reckons that the only useful reading comprehension ‘skill’ to be learnt is comprehension monitoring–in plain language, telling pupils to think about what they’re reading. The same objective can be more effectively realised by simply questioning pupils about what they’ve read. Insofar as the ‘expertise reversal effect’ goes, in an ideal world it wouldn’t kick in until postgraduate education–if then. When I completed my BA in English History in 1993 (just before modularisation kicked in), class papers delivered in seminars were invariably followed by direct instruction from the lecturer, with the aim of clearing up all the gaps and misunderstandings. I couldn’t help but think that it would have been far more profitable for all concerned for the direct instruction to precede the class paper–that way, the student’s research would be far more accurately and profitably directed. Do you have a reference (or references) for the novice/expert table in the post? Thanks for the links – very helpful in seeing the development of your argument over time. Chandler, P. & Sweller, J. (1991) ‘Cognitive Load Theory and the Format of Instruction’, Cognition and Instruction, 8(4), 293-332.
Cooper, G., Tindall-Ford, S., Chandler, P. & Sweller, J. (2001) ‘Learning by imagining procedures and concepts’, Journal of Experimental Psychology: Applied, 7, 68-82. Kalyuga, S. (2007) ‘Expertise reversal effect and its implications for learner-tailored instruction’, Educational Psychology Review, 19, 509–539. Kalyuga, S. (2009) ‘Knowledge elaboration: A cognitive load perspective’, Learning and Instruction, 19, 402-410. Kalyuga, S., Chandler, P. & Sweller, J. (1998) ‘Levels of expertise and instructional design’, Human Factors, 40, 1-17. Kalyuga, S., Ayres, P., Chandler, P. & Sweller, J. (2003) ‘The expertise reversal effect’, Educational Psychologist, 38, 23-31. Kalyuga, S., Rikers, R., Pass, F. (2012) ‘Educational implications of expertise reversal effect in learning and performance of complex cognitive and sensorimotor skills’, Educational Psychology Review, 24, 313-337. Kirschner, P. A., Sweller, J. & Clark, R. E. (2006) ‘Why Minimal Guidance During Instruction Does Not Work: An Analysis of the Failure of Constructivist, Discovery, Problem-Based, Experiential, and Inquiry-Based Teaching’, Educational Psychologist, 41(2), 75–86. Mousavi, S. Y., Low, R. & Sweller, J. (1995) ‘Reducing Cognitive Load by Mixing Auditory and Visual Presentation Modes’, Journal of Educational Psychology, 87(2), 319-334. Paas, F., Renkl, A. & Sweller, J. (2003) ‘Cognitive Load Theory and Instructional Design: Recent Developments’, Educational Psychologist, 38(1), 1–4. Paas, F. G. & Van Merriënboer, J. J. (1994) ‘Instructional control of cognitive load in the training of complex cognitive tasks’, Educational psychology review, 6(4), 351-371. Renkl, A. & Atkinson, R. K. (2003) ‘Structuring the transition from example study to problem solving in cognitive skill acquisition: A cognitive load perspective’, Educational Psychologist, 38, 15-22. Sweller, J. (1988) ‘Cognitive Load During Problem Solving: Effects on Learning’, Cognitive Science, 12(2) 257–285, at 259. Sweller, J. (1994) ‘Cognitive load theory, learning difficulty, and instructional design’, Learning and Instruction, 4(4), 295–312. Sweller, J., Van Merrienboer, J. J., G. & Paas, F. (1998) ‘Cognitive Architecture and Instructional Design’, Educational Psychology Review, 10(3), 251-296.
van Merrienboer, J. J. G, Kester, L. & Paas, F. (2006) ‘Teaching complex rather than simple tasks: Balancing intrinsic and germane load to enhance transfer of learning’, Applied Cognitive Psychology, 20(3), 343-352. Excellent summary of the situation, David! One might summarize the great flaw in progressive education as the idea that there is a “Royal Road” to education in which the student skips Novice and Intermediate stages altogether and goes straight to Advanced. With consummately predictable results. It might be interesting for anyone reading David’s latest to re-experience learning. After reading ‘Talent is Overrated: what really separates world-class performers form everyone else’ (Geoff Colvin), I decided, coming across deliberate practice for the first time, to learn a new skill. I chose plate spinning. I do recommend reconnecting with learning. I experienced that moment when the plate successfully spun, immediately trying to repeat the success and failing. Once you are through that stage and the plate spins regularly, you have the expertise and cross the threshold, never to return. I think that above-level testing should play a more important role in assessing when “students are becoming more advanced”. Teachers are assessing all the time whether their students are advancing in the material that HAS been covered in their lessons. Assessment rarely includes items about skills that have not yet been covered. As a result, there’s an important ceiling effect in most assessments. By using a test that has been standardized for an “older” (more advanced) population, one can find out who’s really advanced AND how far he/she is advanced. When two students “no longer get it wrong”, and “it” is only about material that has been covered, there could be a huge difference in the current developmental level (in the domain being assessed) of these two students. Unless above-level testing is used, this difference will remain invisible and the expertise reversal effect will still apply when treating these two students as “equal”. In short, the usual assessments are about what has been THAUGHT, while what has been LEARNED should be the primary focus. For some students (especially those becoming “experts”), above-level tests are the only way to find out what they have learned. Perhaps we can say, the more advanced a student gets towards being an expert, the more we numerous the assumptions we can make about how much they will infer correctly about our subject.